The eagle was found in the area of Ciutadella in La Vall. 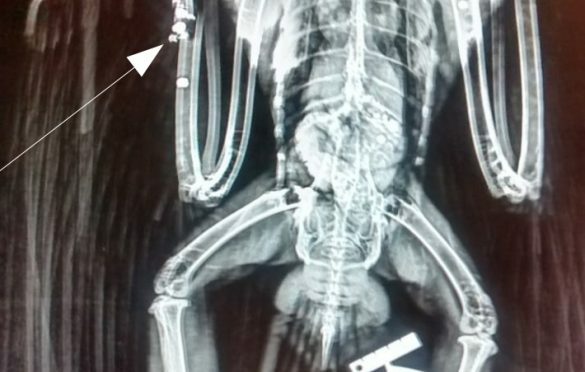 The X-ray that was made of it shows different pellets from a hunting shotgun distributed round the body, and a broken bone in the right wing. The bird is now recovering in one of the cages at the Recuperation Centre. It is very worrying that actions like this are being repeated, and certainly more than are being detected. It is incredible that this happens in an island which presumes to have a special sensitivity with the environment. It will be only a minority of hunters that make these atrocities but they do a great deal of damage. We encourage anyone who might have information on this case, or any other, to let us know. For our part we have made an official complaint to the relevant authorities so that they can investigate and apply sanctions according to the law.